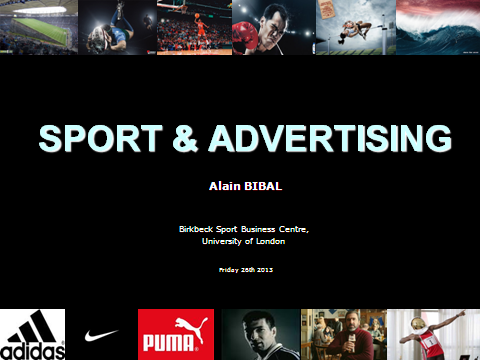 This provocative quotation from the best-selling novel 99 francs by former advertising copywriter Frederic Beigbeder, sets the backdrop to this provocative presentation of the recent history of the relationship between sport and advertising by Alain Bibal. Alain poses the philosophical questions: has the sportsman and sportswoman become little more than metaphorical advertising “sandwichmen”? ; and if they have does this matter? • Beigbeder, F. (2000). 99 Francs. Grasset & Fasquelle. Alain is a manager in the Sport Department of the Mayoralty of Paris. Previously he worked in advertising in France & Australia. He also lectures at the ISC School of Business, University of Paris 11. At 49, he still plays Water Polo for the Racing Club de France and is a former marathon runner. He’s also member of the French Art Director Club.